Mary’s Kitchen was established in July 1984 as the fulfillment of a dream of the Rev. Dr. John Russell, the Rector of St. Mary’s Episcopal Church at the time. Mary’s Kitchen is located at 110 N. Independence Street in downtown Kinston and provides a lunchtime meal to approximately 125 people, 7 days a week, all year long. Anyone is welcome to eat at Mary's Kitchen, no questions asked. Over the years it has become an ecumenical ministry, with monetary and volunteer support from many of the area churches and religious communities. 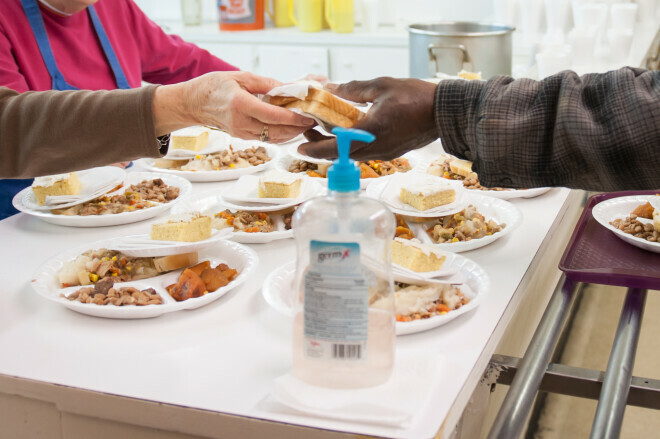 Contributions received from local churches, religious communities, individuals, businesses, the North Carolina Department of Agriculture, the United Way and FEMA help Mary’s Kitchen with food, maintenance and utilities expenses. Mary’s Kitchen is always looking for volunteers. Volunteers serve on assigned day from approximately 7:30 a.m. until noon. For more information please contact Mary’s Kitchen Director, LaTonya Smith, at or call 252-523-6146.